Sponsor Steve Fowell (left) and Champion Brandon Kearney. Brandon Kearney of Bend G&CC (Bend, OR) and Scott Erdmann of Oswego Lake CC (Lake Oswego, OR) broke the Chehalem Glenn GC course record today after posting a 7-under par 65. 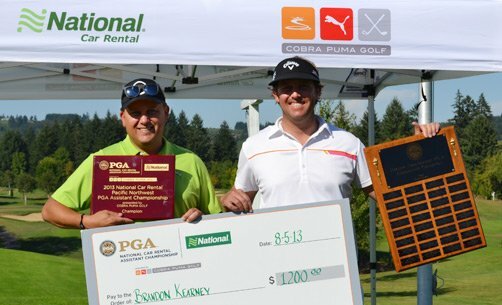 Kearney ended up the champion of the National Car Rental Assistant Championship presented by COBRA PUMA GOLF while Erdmann ended up one stroke back. Josh Immordino of Riverbend GC (Kent, WA) finished in third place. Click here to view final results. 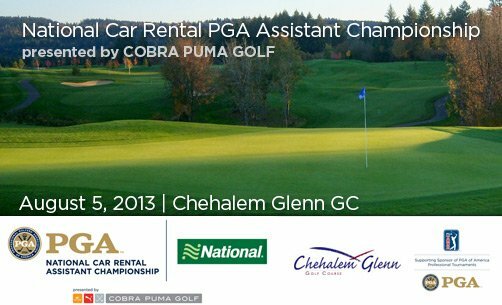 Kearney, Erdmann and Immordino all advanced to the 2013 National Car Rental PGA Assistant National Championship presented by COBRA PUMA GOLF on the Wanamaker Course at the PGA Golf Club in Port St. Lucie, Florida – October 31 – November 3, 2013. Mike Roters of Gateway Golf Discount (Clarkston, ID) scored a hole-in-one on the 16th hole in the morning round. He did have a Sterling Bank account…..it is worth $10,000 at this time. The National Championship tradition began in 1976 to recognize the role of the PGA Assistant Professional and how important he or she may be in the success of a golf facility as well as our entire Association. They represent more than 10,000 men and women assistant professionals and registered apprentices nationwide. Chehalem Glenn GC opened in 1995 to rave reviews and was quickly recognized as one of the most challenging courses in the Portland area. The front nine opened in July of 2005, with the second nine following two years later. In 2010, Chehalem Glenn was featured by the readers of the Portland Business Journal as the #1 Most Challenging Course, #2 Favorite Public Course, and #3 Favorite Course To Host A Golf Tournament. Head PGA Professional Branden Thompson is excited to host.